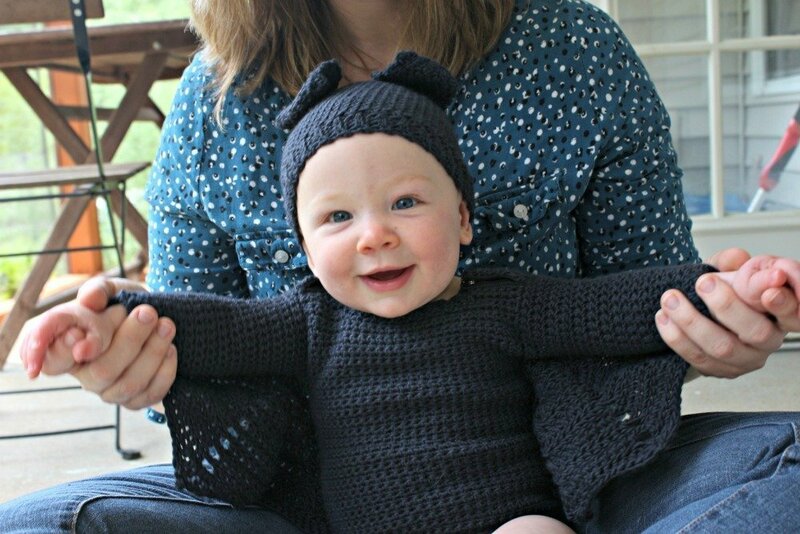 Baby Bat Costume - Free Crochet Pattern - love. life. yarn. Oh where does the time go? It seems like just yesterday we brought this little guy home from the hospital and now he is nine months old!! I took these pictures over the summer when he was smaller but time has just flown by so fast. Maybe it’s because I know this is our last baby (I mean, four boys keep us plenty busy!) but I remember my other boys growing up quickly on me, too. The oldest is almost 9! I love designing baby things, though, and even when we don’t have a baby in the house I will still keep making baby items. I’ll just have to find someone else’s little one to model for me! It’s still super hot here in TN but I’m already thinking fall and thinking about what the boys want to be for Halloween. 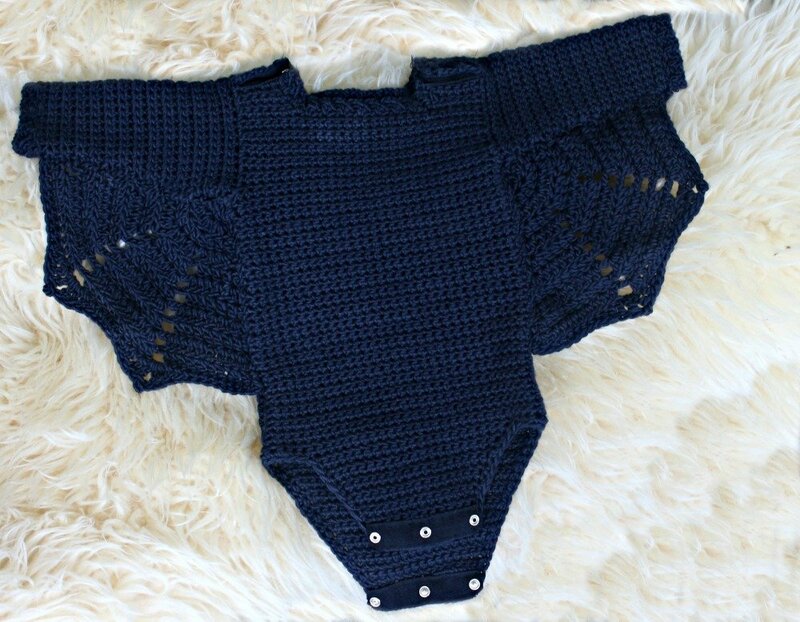 Since the baby has already outgrown this I will have to find something else for him to wear this year but it’s a good excuse to crochet another cute costume. 😉 This was originally designed for I Like Crochet magazine and I really love designing for them. I regularly publish in the two Prime Publishing magazines and you should check them out! Life is so crazy busy right how that I haven’t been designing for anyone else and I have neglected this site over the summer. We are back in school now and things are starting to settle into a routine (thankfully!!). I’m back at work as well and this is the best start to a semester I’ve ever had. I just hope it continues! I am starting to do more and more baby onesies and this is by far my favorite I’ve made to this point. I love how the little bat wings look attached to the body! It also fits really well since I used a onesie as a guide (we sure do have enough of them!) and the snap tape makes it easy to get baby in and out – something that a lot of knit and crocheted baby items don’t think about! I want to be able to easily change a diaper without having to undo a ton of buttons, and, let’s face it – two buttons at the crotch area is not going to stay closed very well so larger buttons don’t work that great. I wanted snaps like a regular onesie and thank goodness snap tape is out there. I just went to my local JoAnn store to the ribbon section and bought it by the yard. It also sews in super easy, too, even if you aren’t good at sewing! It doesn’t take much – I even had some of the 1/4 yard left over. You just want to be sure you have enough snaps to get the crotch area and the shoulder seam (two for the shoulder and three for the crotch) with enough area left around them to attach. I used Malabrigo Worsted for this design and I can’t say enough about how much I love Malabrigo yarns!! The colors are always amazing and the yarn is a dream to work with. Any worsted weight yarn will do for this design if you can get gauge, but if you really want a costume to pass down to any other babies in your life, check out the Malabrigo. Enjoy! To buy an ad-free, large print pdf of this pattern click here! Shown in size 6 months. Ch 3 at beginning of a row does not count as a dc. With larger hook, ch 13 (17). Row 1: Sc in 2nd ch and each ch across, turn – 12 (16) sts. Row 3: Ch 1, 2 sc in first sc, sc to last st, 2 sc in last st, turn – 14 (18) sts. Rows 5-6: Rep Rows 3-4 – 16 (20) sts. Rows 7-8: Rep Rows 3-4 – 18 (22) sts. Rows 9-10: Rep Rows 3-4 – 20 (24) sts. Rows 11-12: Rep Rows 3-4 – 22 (26) sts. Rows 13-14: Rep Rows 3-4 – 24 (28) sts. Rows 15-16: Rep Rows 3-4 – 26 (30) sts. Rows 17-18: Rep Rows 3-4 – 28 (32) sts. Rows 19-20: Rep Rows 3-4 – 30 (34) sts. Row 21: Rep Row 3 – 32 (36) sts. Work even in sc for 40 (45) rows. Row 1: Sl st in first 2 sts, ch 1, sc in each st to last 2 sts, leave rem sts unworked, turn – 28 (32) sts. Rows 2-11: Ch 1, sc in each st across, turn. Row 12: Ch 1, sc in first 7 (9) sts, leave rem sts unworked, turn – 7 (9) sts. Row 13: Ch 1, sc2tog, sc in each st to end, turn – 6 (8) sts. Row 14: Ch 1, sc in each st across, turn. Row 15: Rep Row 13 – 5 (7) sts. Work even in sc for 3 (5) rows. Change to smaller hook, ch 4. Row 1: Sc in 2nd ch from hook and next ch, sc2tog last ch and first st of last row, turn – 3 sts. Row 2: Ch 1, sc blo in each st across, turn. Row 3: Ch 1, sc blo in first 2 sts, sc2tog blo last st and 2nd st of last row, turn. Rep Rows 2-3 across 5 (7) sts of Shoulder. Join yarn at opposite side and repeat from Armhole Row 12. With larger hook, ch 11 (15). Row 1: Sc in 2nd ch from hook and each ch across, turn – 10 (14) sts. Row 2: Work 2 sc in first st, sc in each st to last st, 2 sc in last st, turn – 12 (16) sts. Row 3: Ch 1, sc in each st across, turn. Rows 4-5: Rep Rows 2-3 – 14 (18) sts. Rows 6-7: Rep Rows 2-3 – 16 (20) sts. Rows 8-9: Rep Rows 2-3 – 18 (22) sts. Rows 10-11: Rep Rows 2-3 – 20 (24) sts. Rows 12-13: Rep Rows 2-3 – 22 (26) sts. Row 14: Ch 6, sc in 2nd ch from hook and in each st across – 27 (31) sts. Row 15: Rep Row 14 – 32 (36) sts. Work same as Back to Ribbing. Fasten off. With smaller hook, join yarn at neck edge, ch 3. Row 1: Sc in 2nd ch from hook, sc2tog last ch and first st of last row – 2 sts. Row 3: Ch 1, sc blo in first st, sc2tog blo last st and 2nd st of last row, turn. Rep Rows 2-3 around neck edge, working from one shoulder to another. Sew snap tape to Shoulder seams, overlapping ribbing. Tack Armhole edges. With larger hook, join yarn at underarm seam. Rnd 1: Ch 1, sc 32 (34) sts evenly around, turn – 32 (34) sts. Rnds 2-3: Ch 1, sc in each st around, turn. Rnd 4: Ch 1, sc2tog, sc in each st to last 2 sts, sc2tog – 30 (32) sts. Rnds 5-6: Ch 1, sc in each st around, turn. Rnds 7-9: Rep Rnds 4-6 – 28 (30) sts. Rnds 10-12: Rep Rnds 4-6 – 26 (28) sts. Rnds 13-15: Rep Rnds 4-6 – 24 (26) sts. Rnds 16-18: Rep Rnds 4-6 – 22 (24) sts. Rnds 19-20: Ch 1, sc in each st around, turn. Rnd 21: Rep Rnd 4 – 20 (22) sts. Work even in sc for 14 (18) rnds, turning at each end. Change to smaller hook, ch 3. Row 1: Sc in 2nd ch from hook, sc2tog last ch and first st of last rnd – 2 sts. Row 3: Ch 1, sc blo in first st, sc2tog blo last st and 2nd st of last rnd, turn. Rep Rows 2-3 around Sleeve edge. With larger hook, ch 6. Row 1: Dc in 4th ch from hook and in next 2 ch, turn – 3 sts. Row 2: Ch 3, 2 dc in each st, turn – 6 sts. Row 3: Ch 3, (dc in next st, 2 dc in next dc) 3 times, turn – 9 sts. Row 4: Ch 3, (2 dc in next dc, dc in next 2 sts, ch 2) 3 times, turn – 12 sts. Row 5: Ch 3, (dc in next 3 dc, 2 dc in next dc, ch 2) twice, dc in next 3 dc, 2 dc in next dc, turn – 15 sts. Row 6: Ch 3, (2 dc in next dc, dc in next 4 dc, ch 2) twice, dc in next 4 dc, 2 dc in next dc, turn – 18 sts. Row 7: Ch 3, (dc in next 5 dc, 2 dc in next dc, ch 2) twice, dc in next 5 dc, 2 dc in next dc, turn – 21 sts. Row 8: Ch 3, (2 dc in next dc, dc in next 6 dc, ch 2) twice, dc in next 6 dc, 2 dc in next dc, turn – 24 sts. Row 9: Ch 3, (dc in next 7 dc, 2 dc in next dc, ch 2) twice, dc in next 7 dc, 2 dc in next dc, turn – 27 sts. Row 10: Ch 3, (2 dc in next dc, dc in next 8 dc, ch 2) twice, dc in next 8 dc, 2 dc in next dc, turn – 30 sts. Row 11: Ch 3, (dc in next 9 dc, 2 dc in next dc, ch 2) twice, dc in next 9 dc, 2 dc in next dc, turn – 33 sts. Row 12: Ch 1, sc in next 8 dc, hdc in next dc, dc in next dc, tr in next dc, (tr, ch-3 picot, tr) in ch-2 sp, tr in next dc, dc in next dc, hdc in next dc, sc in next 5 dc, hdc in next dc, dc in next dc, tr in next dc, (tr, ch-3 picot, tr) in ch-2 sp, tr in next dc, dc in next dc, hdc in next dc, sc in next 8 dc. Sew Wing to underarm using photos as guide. Join yarn at left side seam of Leg opening. Sc evenly around, working 3 sc in corners. Fasten off. Sew snap tape to bottom of Front and Back, using photos as a guide. With larger hook, make a magic ring. Rnd 1: Work 6 sc in magic ring, pull tight to close, join with sl st to first sc – 6 sts. Rnd 2: Work 2 sc in each st around – 12 sts. Rnd 3: *Sc in next st, 2 sc in next st; rep from * around – 18 sts. Rnd 4: *Sc in next 2 sts, 2 sc in next st; rep from * around – 24 sts. Rnd 5: *Sc in next 3 sts, 2 sc in next st; rep from * around – 30 sts. Rnd 6: *Sc in next 4 sts, 2 sc in next st; rep from * around – 36 sts. Rnd 7: *Sc in next 5 sts, 2 sc in next st; rep from * around – 42 sts. Rnd 8: *Sc in next 6 sts, 2 sc in next st; rep from * around – 48 sts. Rnd 9: *Sc in next 7 sts, 2 sc in next st; rep from * around – 54 sts. Rnd 10: *Sc in next 8 sts, 2 sc in next st; rep from * around – 60 sts. Rnd 11: *Sc in next 9 sts, 2 sc in next st; rep from * around – 66 sts. Work 15 (18) rnds even – 60 (66) sts. Change to smaller hook, ch 5. Row 1: Sc in 2nd ch from hook and in next 2 ch, sc2tog last ch and first st of last rnd, turn – 4 sts. Row 3: Ch 1, sc blo in first 3 sts, sc2tog blo last st and 2nd st of last rnd, turn. Row 1: Sc in 2nd ch from hook and in each ch across, turn – 8 sts. Row 2: Ch 1, 2 sc in first st, sc in each st to last st, 2 sc in last st, turn – 10 sts. Rows 3-4: Ch 1, sc in each st across, turn. Row 5: Rep Row 2 – 12 sts. Rows 6-9: Ch 1, sc in each st across, turn. Row 10: Ch 1, sc2tog, sc in each st to last 2 sts, sc2tog – 10 sts. Row 11: Rep Row 10 – 8 sts. Row 12: Rep Row 10 – 6 sts. Row 13: Rep Row 10 – 4 sts. Row 14: Ch 1, sc2tog twice, turn – 2 sts. Row 15: Ch 1, sc2tog – 1 st.
Sew Ears on Hat using photos as a guide. That’s it! 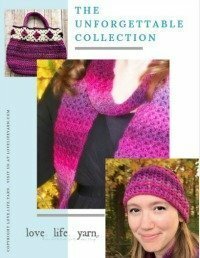 I really hope you have enjoyed this free crochet pattern as much as I enjoyed designing it! Please check out my other Free Baby Crochet Patterns. After the original cast on, do I switch to the smaller needle? The smaller hook is only for the ribbing – everything else is worked with the larger hook. Hello! I’m stuck on the neckline ribbing. Do I just pick any of the 4 sides where the strap meets the ribbing? Start at the top of one of the neck edges. You have to work the neck ribbing separately for the front and the back so that they can open at the sides with the snap tape. Just join to the top of one neck edge and work around to the other. Awesome! So it starts by going down the side of the “strap” and then across the neckline? This is such A GREAT costume/ pattern. Thank you SO MUCH!! Hi! If I wanted to do this for newborn, how would I decrease my number of chains/ stitches? Thank you!